The Town House Fontana di Trevi is a new elegant accommodation located in the very heart of Rome, at only 25 mt from the enchanting Baroque masterpiece of Trevi Fountain. 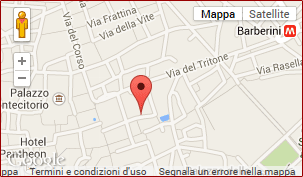 It’s exactly located in Via dei Crociferi 41, close to the major tourist attractions offered by the Eternal City. This charming property has been still inaugurated, and offers luxury rooms elegantly furnished housed in a noble building dated XVI Century. The Trevi Fountain is maybe the most famous fountain of Rome and maybe one of the most famous of all over the world. This 18th century fountain has been planed by the famous artist Bernini and Nicolò Salvi, and is an harmonious union of classicism and baroque style. According to the legend, if you throw a coin into the water by expressing a wish, it will become true and you will certainly return to the Rome. The perfect position of the Town House Fontana di Trevi will allow you to discover walking the whole historical centre of Rome: in a few minutes, you will reach Piazza di Spagna, another symbol of the city, Rome’s luxury shopping area between Via Frattina, Via dei Condotti and Via del Corso; Piazza del Popolo, the Ara Pacis and more. In a few minutes you will also reach the Tiber’s banks and have a pleasant walk direct to the imposing St. Peters’ cathedral and the most popular museums of the world: the Vatican Museums. The Town House Fontana di Trevi is also located at only 500 mt from two of the most central subway stops: Barberini (Line A) and Piazza di Spagna (Line A). In this way you’ll reach all the major sights of Rome in a very short time: the Colosseum, the Roman Forum and Castel Sant’ Angelo. The accommodation is also close to Via Veneto, well-know all over the world for the most famous Fellini’s movies, “La Dolce Vita”, describing the “sweet life” of Via Veneto, one of the main streets of Rome, especially for its cafés, restaurants and shops. All the rooms of the Town House Fontana di Trevi are located on the 2nd floor of a noble roman building, served by an elevator. The helpful staff will be at your disposal during your holiday and will give you the best suggestions about restaurants, museums, theatres, excursions and will get you for free a useful map of Rome. Important: Check in can be made from 10.00am to 6.00pm. For latest arrivals we please you to contact us by e-mail, informing about your approximate arrival time: this information is very important for us in order to guarantee the best service.